↑ Martin, Elizabeth. Concise Colour Medical Dictionary (in ਅੰਗਰੇਜ਼ੀ). Oxford University Press. p. 375. ISBN 9780199687992. ↑ "The World Factbook". www.cia.gov. July 11, 2016. Retrieved 30 July 2016. ↑ "Preterm birth Fact sheet N°363". WHO. November 2015. Retrieved 30 July 2016. ↑ Buck, Germaine M.; Platt, Robert W. (2011). Reproductive and perinatal epidemiology. Oxford: Oxford University Press. p. 163. ISBN 9780199857746. ↑ Co-Operation, Organisation for Economic; Development (2009). Doing better for children. Paris: OECD. p. 105. ISBN 9789264059344. ↑ Olsen, O; Clausen, JA (12 September 2012). "Planned hospital birth versus planned home birth.". The Cochrane database of systematic reviews (9): CD000352. PMID 22972043. ↑ Fossard, Esta de; Bailey, Michael (2016). Communication for Behavior Change: Volume lll: Using Entertainment–Education for Distance Education. SAGE Publications India. ISBN 9789351507581. Retrieved 31 July 2016. ↑ Memon, HU; Handa, VL (May 2013). 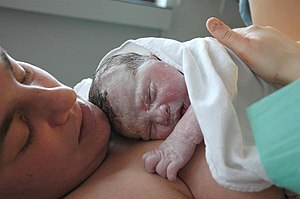 "Vaginal childbirth and pelvic floor disorders.". Women's health (London, England). 9 (3): 265–77; quiz 276–7. PMID 23638782. ↑ 10.0 10.1 10.2 10.3 10.4 10.5 10.6 10.7 "Pregnancy Labor and Birth". Women's Health. September 27, 2010. Retrieved 31 July 2016. ↑ McDonald, SJ; Middleton, P; Dowswell, T; Morris, PS (11 July 2013). "Effect of timing of umbilical cord clamping of term infants on maternal and neonatal outcomes.". The Cochrane database of systematic reviews (7): CD004074. PMID 23843134. ↑ Hofmeyr, GJ; Hannah, M; Lawrie, TA (21 July 2015). "Planned caesarean section for term breech delivery.". The Cochrane database of systematic reviews (7): CD000166. PMID 26196961. ↑ Childbirth: Labour, Delivery and Immediate Postpartum Care (in ਅੰਗਰੇਜ਼ੀ). World Health Organization. 2015. p. Chapter D. ISBN 978-92-4-154935-6. Retrieved 31 July 2016. ↑ Molina, G; Weiser, TG; Lipsitz, SR; Esquivel, MM; Uribe-Leitz, T; Azad, T; Shah, N; Semrau, K; Berry, WR; Gawande, AA; Haynes, AB (1 December 2015). "Relationship Between Cesarean Delivery Rate and Maternal and Neonatal Mortality". JAMA. 314 (21): 2263–70. PMID 26624825. doi:10.1001/jama.2015.15553. ↑ 15.0 15.1 15.2 Education material for teachers of midwifery : midwifery education modules (PDF) (2nd ed.). Geneva [Switzerland]: World Health Organisation. 2008. p. 3. ISBN 978-92-4-154666-9. ↑ Martin, Richard J.; Fanaroff, Avroy A.; Walsh, Michele C. Fanaroff and Martin's Neonatal-Perinatal Medicine: Diseases of the Fetus and Infant (in ਅੰਗਰੇਜ਼ੀ). Elsevier Health Sciences. p. 116. ISBN 9780323295376.